Your significant other should be the easiest person to shop for! Jewelry, shoes, and a handbag you really cannot go wrong with these items if she is a girly girl. Please unless you are extremely metro do not try to pick out clothes for your lady. Most times it is not really her style but yet your attempt to put her in something low-cut or beyond short. The same goes for lingerie; this is a gift for you not for her. It’s the reason we buy lingerie for ourselves on Valentines day, because it is for you. Lets start with jewelry. You cannot go wrong with earrings. 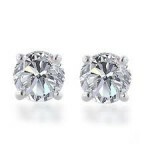 Every girl will love a simple diamond stud or a hoop. 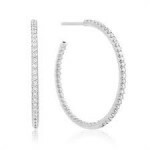 Depending on your budget you can go with a simple stud to an intricate one or get her an infinity hoop (which is a hoop earring with diamonds on the outside and on the inside of the hoop). Below is a picture of the infinity hoop. They come in all different sizes with varying amount of diamonds. Aside from size where you purchase them from will also determine their price. All jewelry stores will have these two staples and these are earrings she can wear for a special occasion or daily. They are timeless pieces that all women love. Just make sure to check if she already has something like this. 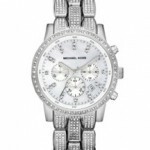 Another jewelry item that is very in right now is Michael Kors watches. They come in all colors and range from a standard watch to one with diamonds or pricier ones that are ceramic. They are a great gift just make sure to know if your wife or girlfriend prefers gold, silver, rose gold or a color. They have many styles to choose from and you can get them at department stores such as Dillards or from an actual Michael Kors store. In the photo gallery section I have attached a few of my favorites for you. If your lady is like me you cannot go wrong with a pair of shoes but you have to pick ones out that are her style. If you have a hefty budget then you cannot go wrong with Louboutins or as most guys call them “red bottom shoes”. If she is classic go with a black patent leather, a little edgy try a pair of leopard ones. If she really loves shoes but you want something a little more affordable try the brands Chinese laundry, the website lulus.com and Steve Madden. Again please see the gallery below. A very cute idea to put with the shoes is to say, “Please wear these on the special evening I have planned for us”. Give her a time to be ready by and a dress code such as cocktail attire. Women love when you take time to plan something and a very cute note attached to the shoes would be perfect. Finally, purses are great if again you have a girly girl. Most women like to pick out their own everyday purse so try a fancy clutch instead that she can use out for a night on the town or a party so in other words not her everyday bag. For those of you that are reading the word clutch and scratching your heads it is a small purse that she carries with her hand (as opposed to on her shoulder with a strap). Please see the photo gallery below for some great options. 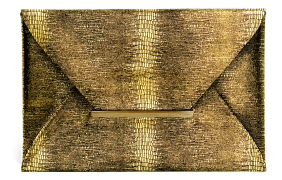 The gold one that looks like an envelope is from BCBG.com and is $78. 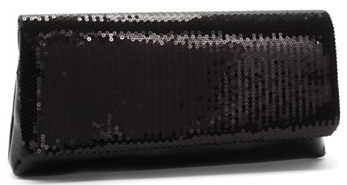 The black sequin clutch is from Macys.com and is only $30! Another cute idea to tie these gifts together would be to hide the earrings inside the clutch and then again say please wear these accessories for our special night on: date, time, attire. Tons of brownie points for you!! If your special lady is not into the things above there are many other great gifts. Does she love to read? There are so many new electronic book devices ranging from a Kindle at about $80 to an iPad 2 starting at $500. If you get her an iPad there is a notes section. Be sure to write her a cute note in the section if you open it up and set it up for her. Also if she likes to workout and does not already have an IPod this would be a great gift. I think it would be extra special if you downloaded playlists on there for her like some of your guy’s favorite songs and a workout playlist. It is the extra special touch she will really appreciate. Also if she likes a particular activity try to get her something for that. Most guys hesitate to get women workout stuff but if she is a huge workout nut this is not offensive. A special pair of running shoes or workout ear buds is great for a runner. If she likes to bike, a special seat cover or something to make her ride more enjoyable would be appropriate. If she is a dance fanatic maybe the Zumba DVDs or if she already loves Zumba cute Zumba inspired workout wear. Guys you will know if she is the type of lady who would like something like this or be offended. I do not suggest buying her say a treadmill or workout DVDs unless she has asked for one and not for weight loss but more for the enjoyment of the activity. For example, I would love an elliptical and would not be offended if I ever got one. Some women can be touchy on this subject so gauge it appropriately and I find it best to buy something that relates to an activity that she already does. Maybe your wife or girlfriends one request is just to spend more time with you. IF this is a case plan a romantic getaway. The more details the better! Do not leave anything up to her. A woman wants to be swept off her feet. Pick out the destination, make the hotel reservations, pick out restaurants and have a list of activities for her to choose from. She will see the thought and effort and be blown away! 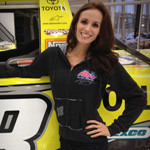 Finally, if your wife is a race fanatic then go to rowdybusch.com and get her some cool gear! If your budget allows plan a special weekend in advance where you buy the race tickets, book the hotel or infield spot and so on. Make it extra romantic by finding fun things to do around the track such as wineries, hikes, tours etc.